The main reasearch field of the ASUR group is the chemistry and dynamics of the stratosphere. In particular research is done on the physical and chemical processes that lead to stratospheric ozone destruction. Ozone is a trace gas in the atmosphere which is mainly found in a region between about 10 and 50 km altitude, the stratosphere. Ozone absorbs ultra-violet radiation from the sun such that the stratophere is heated and the Earth's surface is proctected against this harmful radiation. Since the ozone hole was discovered over Antartica in 1985, and recurring ozone depletion in the Arctic region, atmospheric chemistry is in need of accurate and reliable data of spatial and temporal variation of molecules important in stratospheric ozone destruction. A major contributor to this ozone destruction is found in chlorine compounds of anthropogenic origin. The lack of sunlight in polar winter leads to the formation of a low pressure system in the stratosphere, the polar vortex, that isolates polar airmasses from mid-latitude air and in which very low temperatures are can be present. 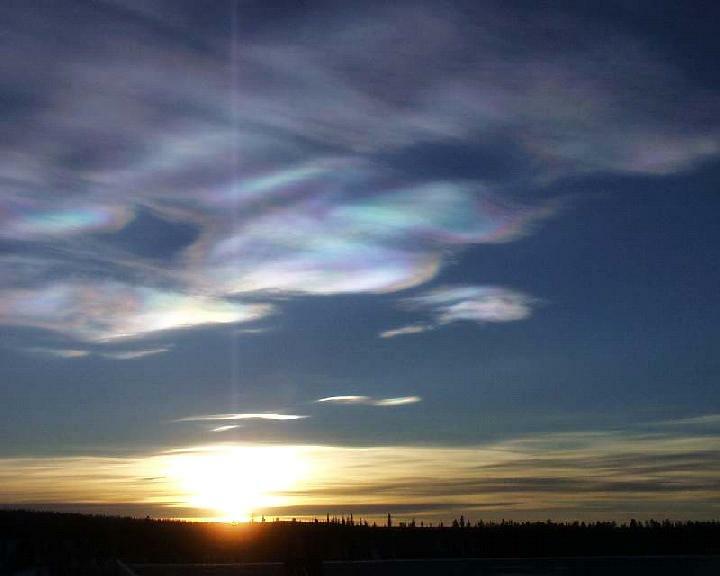 The low temperatures in turn lead to the formation of polar stratospheric clouds (PSCs), consisting mainly of nitric acid (HNO3) and water, in an altitude range of about 15-30 km. The surfaces of these cloud particles allow fast reactions that release chlorine which in turn destroys ozone catalytically after sunlight returns in polar spring. Click here for an electronic textbook on stratospheric ozone (provided by NASA's Goddard Space Flight Center, Atmospheric Chemistry and Dynamics Branch). PSC observed in Kiruna, Sweden, on January 27, 2000. The ASUR sensor is capable of measuring vertical profiles of many trace species in an altitude range of about 15 to 50 km with a good horizontal resolution. 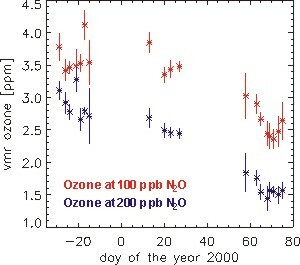 By measuring ozone mixing ratios, ozone loss in the stratosphere can be quantified. Measuring variations of N2O, which is a very stable compound in the lower stratosphere, allows to determine dynamic changes in the atmosphere which in turn enables to seperate dynamical from chemical effects and to calculate chemical ozone loss. 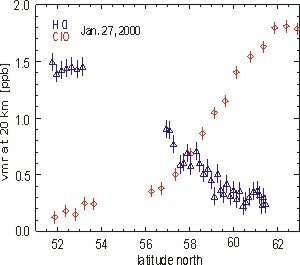 Daily vortex averages of ozone observed by ASUR in Arctic winter 1999/2000. 100 ppb N2O correspond to 19 km, 200 ppb N2O, correspond to 16 km altitude in March 2000 [Bremer et al., 2002]. By detecting the chlorine compounds ClO and HCl, ASUR can survey the spatial distribution of chlorine activation and its development in time. These data allows to refine our understanding of chlorine activation and catalytic ozone destruction and enables chemical process studies, e. g. in presence of PSCs or near the edge of the polar vortex. The horizontally highly resolved measurements of gas-phase HNO3 allow to study formation, development and composition of PSCs [von König et al., 2002]. These measurements are particularly powerful if measurements of the aerosol distribution are available, e. g. by lidar. Observations of HNO3 over the polar winter allow to detect and quantify the removal of HNO3 from the stratosphere by sedimenting PSC particles, known as denitrification [Kleinböhl et al., 2002]. Since the winter of 1991/92 measurements have been performed nearly every year, in order to obtain information on possible trends of trace-gases in the stratosphere. We participated in all major European stratosperic measurement campaigns (EASOE (European Arctic Stratospheric Ozone Experiment), SESAME (Second European Stratospheric Arctic and Midlatitude Experiment), THESEO/THESEO-2000 (Third European Stratospheric Experiment on Ozone)), as well as the American lead SOLVE (SAGE III Ozone Loss and Validation Experiment) campaign in winter 1999/2000. In winter 2002/2003 ASUR will take part in the EUPLEX (European Polar Stratospheric Cloud and Lee wave Experiment) campaign. Our data is also being used to validate complex 3-D chemical transport models such as SLIMCAT from the University of Leeds, UK, and REPROBUS from CNRS, France. Further ASUR flew several campaigns to validate sensors on board the satellites UARS, ERS-2, and ADEOS. ASUR will also participate in the airborne validation campaign for the SCIAMACHY and MIPAS sensors on board ESA's ENVISAT satellite, which has been launched recently. Lately the altitude range for profile information has been extended to 65-70 km by the implementation of an additional high-resolution spectrometer into the ASUR instrument. With this modification it will be possible to obtain detailed information on dynamics and chemical composition of the mesosphere. With these new capabilities ASUR will be deployed on the LEONID Multi-instrument Aircraft Campaign in November 2002. Click here for a background article on Leonid MAC research (provided by the Astronomical Society of the Pacific). The aim of ASUR's participation in this campaign is to study the influence of the Leonid meteor shower on the upper atmosphere and to search for - possibly organic - ablation products inserted by the Leonid meteors into the mesosphere. So this will be ASUR's first mission related to astrobiology.